A short biography of Simeon Pravda, one of the most colourful of the Makhnovist commanders. Simeon Pravda was born into a family of farm-hands in Lyubimovka near Alexandrovsk. He became an anarchist-communist from 1904, and took part in armed actions against the Tsarist regime. He worked on the railway as a coupler at Gaychur station in 1905,and it was there that he was involved in an accident that led to the loss of both his legs. From 1907 to 1917, he earned his living by playing the accordion. In autumn 1918 he organised armed bands to fight the Hetman Skoropadsky and his German and Austrian allies and personally participated in the fighting by using a taganka (a cart usually with a mounted gun much favoured by the Makhnovists) . He probably aided the Makhnovist forces when they attacked Zherebets on the night of November 20th 1918, leading to the flight of the nationalist unit holding the village. 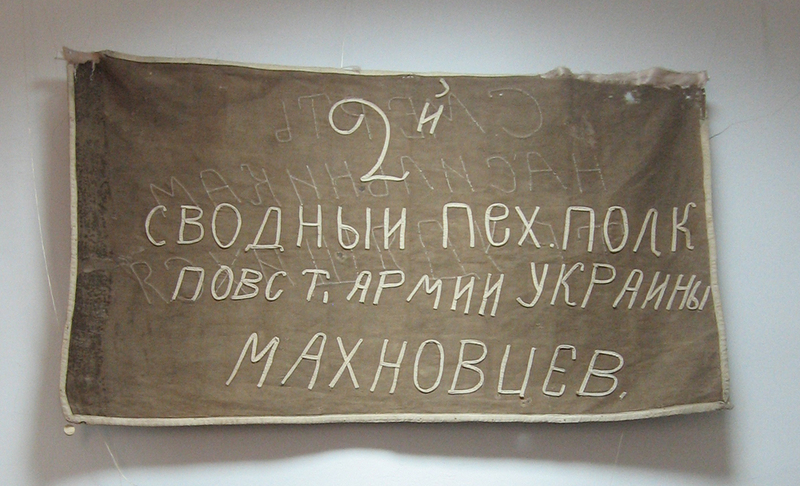 In January 1919 his units joined the Makhnovist movement with the congress of partisan unit leaders on the 3rd at Pologi. He was appointed deputy chief for the formation of new units. Belash alleges that he was involved in a number of incidents at Krasnopil near Zherebets one of which involved the shooting of his own brother Mitka in a drunken quarrel. He told the German Mennonite teacher Gerhard Schroeder that he would never be taken alive and would use his pistol to kill himself. In June 1919 he took part in the struggle against the Bolshevik government. In autumn of the same year he was a Makhnovist regimental commander through to the winter of 1919-1920. He then was in charge of the Makhnovist hospitals from December 1920 - March 1921 and then was in charge of the Makhnovist staff headquarters. After Makhno fled over the border to Romania he continued the guerrilla struggle. The Red Army engaged his unit at Turkenovka in Alexandrovsk county on Nov. 13, 1921 and he died in the fighting. Apparently he was true to his word and shot himself rather than be captured by the Reds. Red Army soldiers cut his body to pieces and his brother Grichka was shot by them. His name is one of ill-repute among the German Mennonite community that lived in the Ukraine. He is unfavourably depicted in the novel about this community , Russlander, by Sandra Birdsell. He is described as a " good for nothing louse, a peasant who had fallen on hard times". The unhappy relations between the Mennonites and the Makhnovists deserve to be examined in greater detail and an investigation into the atrocities allegedly committed by the Makhnovists should take place. I've published this revision, but the picture doesn't seem to be working. If you're having problems, you could try e-mailing it to us and we'll put it up.